This SAND-FREE benefit is only available in products developed by CGear Sand-Free. First developed as a deployable Heli mat for military and civilian helicopters to land on in sandy and dusty environments CGear Sand-Free brings its Patented technology to the Tote Bag. CGear Sand-Free MAT is really a 21st century camping mat or ground sheet offering a sand-free and clean outdoor experience. 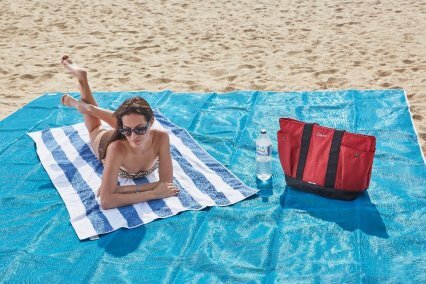 The MAT is designed to place table and chairs on in a camping or picnic setting and lay a towel in the center while at the beach creating a Sand Free barrier. The unique benefit is that Sand, Dirt & Dust in your outdoor environment will disappear through the weave providing comfort in the outdoors. 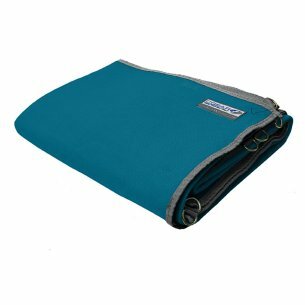 The MAT is made from resilient materials easily cleaned therefore is an all-round outdoor MAT to place in the back of the car to take to the beach, soccer games, picnics, anywhere! No machine washing - simply wash with a hose. 4 sizes available - 3, 6, 10 & 14 seated persons. CGear sand-frees unique weave is a "one-way sift" ensuring sand, dirt & dust will fall through to the ground and not come back up. Enjoy this truly unique benefit constructed within a well-made and stylishly designed Rugs. Enjoy your outdoors SAND-FREE.